Fertilize yearly, in the spring with a dilute (half strength). 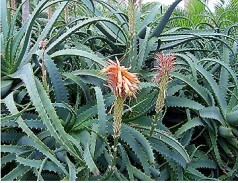 Aloes are propagated by removing the offsets which are produced around the base of mature plants, when they are a couple inches tall (or larger). I usually let them get 4 to 6 inches. Aloe plants love bright sun, but will do fairly well in medium light as well. Allow the soil to dry between watering and water less in the winter than in the warm months. They like being pot bound in my experience, and may be divided each spring or before if you have a lot of baby plants in the pot. The aloe is a succulent plant, with leaves that can hold water for long periods at a time. Too much water can rot the plant, and it would take the most severe drought to dry it out. The plant’s only other enemy is cold. It will do quite well next to a window with even minimal light, but it prefers bright, indirect lighting. An aloe plant is a welcome friend in the kitchen. Potting aloe is a great children’s project by the way. The plants are easy to handle, and hardy enough for little hands to replant. The aloe vera plant has few problems and pests, but it is sensitive to over-watering. Waterlogged, soggy soil can cause blight, water mold, crown rots and fungal leaf spots. The aloe vera is amazingly resistant to most pests, but is sometimes attacked by the mealy bug. Manual removal of the pest or a spray of half-water, half-methylated spirits will repel the insects. The best preventative measure is to avoid over-watering. The medicinal properties of Aloe vera have been known and recorded since biblical times. It has been used for a variety of ailments, and as an ointment for burns, cuts, and rashes, as well as an ingredient in various beauty preparations. The sap of the Aloe is a thick, mucilaginous gel. It is this gel which is used medicinally. The outer skin has essentially no value, but because it is commercially easier and less expensive to utilize the entire leaf, 'whole leaf' Aloe juice has been hyped as the 'best'. This is not the case.